Ahhh, that was fun. Not just yesterday’s sale, but the whole year. We launched Posh Yarn on April 16th, and it’s been one mad party (with the odd tear thrown in, because no self respecting party is without some tears) ever since. Tonight the website will close for the holiday break, and re-open in the first week of January. I’m going home, to spend some time with my family, and I can’t wait. I’m looking forward to switching off, chilling out, and being pampered and spoiled. But, I must confess, I’m going to miss you all. I’ve got to know so many of you over the last few months, and many of my customers have become good friends. Checking here to read your comments, and reading your emails are always the highlights of my day. Absence will make the heart grow fonder. So, all that remains for me to do is to thank you for your support and company over the last year, and tell you how much I’m looking forward to seeing you in the new one. 2007, here we come! So, 2006 is drawing to a close. Almost a year ago, it was declared the year of the sock, and how true that turned out to be. Our sock yarn sales are way ahead of all our other yarns, although lace weight is definitely gaining in popularity. The Sock Club was one of our outstanding successes this year, and I’m looking forward to lots of you joining us next year, because we have so much fun with the club. As I’ve mentioned before, there will be a few changes to Posh Yarn for 2007. But rest assured, the only change for our sock yarn, is more, more, more. More quantity, more shades, more types. I love knitting socks, I love dyeing yarn for socks, and apparently, you love buying yarn for socks! We have a match made in heaven, don’t you think? 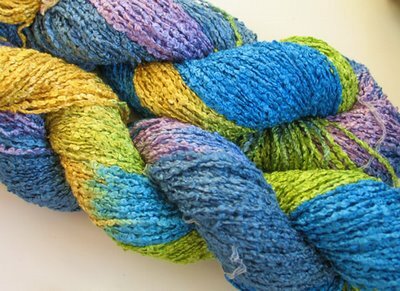 I’m using this week’s sale to try out a new sock yarn. We only have a small quantity, and I’m waiting for your feedback before deciding whether to get more. It’s called Emily, and is 80% lamsbwool, 10% angora, 10% cashmere. It is superbly soft, and looks like it will knit up into fabulous socks. Each 100g skein has 400 yards of yarn, and I would recommend 3.5mm needles for it. Whoever gets this yarn, do send me your feedback! So, as always, the sale goes live at 5pm tomorrow. The sale preview is now up, so do have a browse around at your leisure. Since we are so close to Christmas, and post is now delayed, we will be sending all orers over £50 by Special Delivery (free of charge) to guarantee delivery before Christmas. Sadly, this only applies to UK buyers. 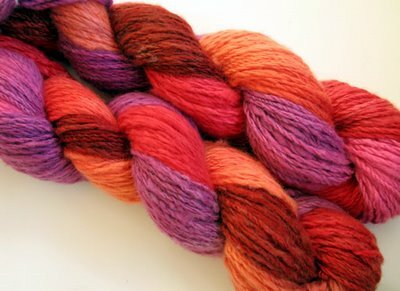 But even if you didn’t get your yarn in time for the holidays, what better way to start off 2007 than with a little piece of cashmere heaven?! Do not adjust your sets. This week One Off Wednesday sale is a burst of colour. Some might feel that drabber, darker colours are more seasonal, but I’m inclined to think that bright colours are even more important in the dark days of winter than they are in summer. And I think Nature agrees with me. This morning I awoke to a pre-sunrise sky that was brilliant crimson, an awe inspiring sight, especially contrasted against the fields that were silvery with frost. It was perfection. 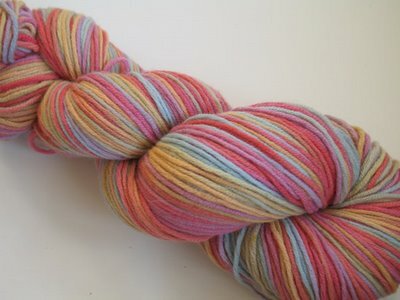 So, this week’s yarn is completely Technicoloured. Yes, there will be soft pastels, yes, there will be muted, masculine, muted tones. But more than anything else, there will be glorious, heart lifting colour. And you can now see it in all its glory as a preview on the sale page. Whew, this is going to be a bi-i-i-ig week. I think we went a little nutty when it came to dyeing yarn for this week’s sale, because when we got all the skeins together in a pile, well, let’s just say we’re talking Mt Everest in cashmere. So, much labelling, photographing, listing, packing work ahead of me this week. Plus I’m still working on the new website (any features you’d like to see changed/added/removed? ), and trying to get things ready to go home to my family next weekend, and spend a week with them. So, much preparation was needed for today’s workload. I’ve had a triple espresso (and now I’m twitching like a Mexican jumping bean), I’ve stoked up the woodburner (because it is freezing here today), I’ve got jaunty music on the CD player, and I’m wearing my comfiest sweats (which consist of an ‘Oy with the poodles already’ tee and floor sweeping yoga pants). I’m ready. I’m set. I’m good to go. 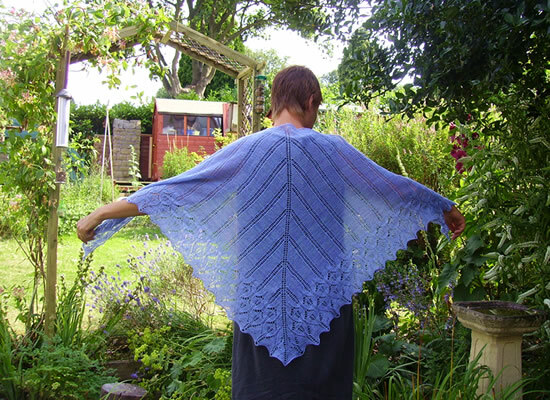 Do you remember this lovely Icarus shawl, knitted by Judith from our Cecilia cobweb weight yarn? Well, Miriam Felton, who designed this shawl, as well as other classic patterns, such as Seraphim, has made these patterns available through Hipknits. I’m seriously thinking of asking Mama to knit me one of these – she has more time and patience than I do, and loves knitting shawls, but won’t wear them herself. That Mountain Peaks shawl would be to die for in Sophia 2ply. Or maybe Seraphim in Eva 2ply. Or Icarus in Cecilia. Ok, I want them all. How greedy do you think a daughter can get away with being? Well, that To-Do list has conceded defeat in the face of my determination. Every outstanding order is finished, all of the parcels are on their way. Next week, we’ll be cramming in a big last minute sale, and offering free Special Delivery on all UK purchases over £50, to guarantee that your yarn will get to you before Christmas. Then, on December 22nd, the Posh Yarn site will be shutting down for the holidays. And when we return in the New Year, it will be with the new and improved Posh Yarn. The site re-design, which I’ve been squeezing in ten minutes on, here and there, is looking so good. I can’t wait for you all to see it. Or to tell you about our plans for 2007. I think it’s going to be a Posh Year.